154 pages | 11 B/W Illus. Education has long been highly valued in China, and continues to be highly valued, both by the state, which appreciates the value of education for maintaining China's economic rise, and by parents, who, affected by the One Child Policy, devote a large proportion of their incomes to their one child's education. 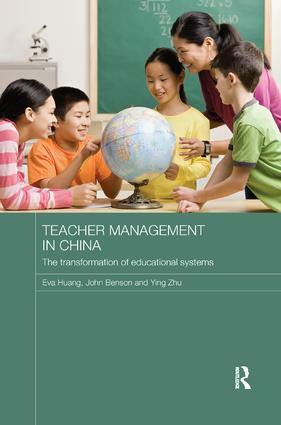 This book explores current systems of teacher management in China and assesses their effectiveness. It charts the development of China's education system, outlines present day human resource management methods in Chinese schools, including practices for recruitment and selection, training and development, performance appraisal, and rewards, both pay and non-financial rewards, and describes recent changes and innovations. The book concludes that a high performance work system, enhanced by traditional paternalistic humanised management and by pragmatism, predominates, with important consequences for teachers’ jobs and performance, and for the quality of students' school life. Eva Huang is a Lecturer at George Brown College, Canada. John Benson is a Professor and Head of the School of Business at Monash University, Malaysia, and an Adjunct Professor in the Department of Management at Monash University, Australia. Ying Zhu is a Professor and Director of the Australia Centre for Asian Business at the University of South Australia.